thAn ugandha Ur – (amarar vEndhan thAn ugandha Ur) (angu aruL illAth thanmaiyALan thAn ugandha Ur) – (thirukkOvalUr is the) place where unsurpassed enjoyer is present; place where One having the quality of finishing the enemies is present. paramapadham is the place where nithyasUris and Himself are happily present; (whereas) this place is one in which the samsAris have turned away from Him but He by Himself is happy to be present in. For avoiding the decay of His properties He Himself came in support and is standing – such is this place. By this – places of His liking (dhivya dhESams) are the ones (for us) to be present in, and are our destiny. while having the aforementioned power, coming here (in the form of archai) and standing as if to say ‘there is no breath’ thus making Himself under their control – we see sauSeelyam; being visible to the eyes – we see saulabhyam. Since nithyasUris come here for getting more rewards (that is, enjoyment of Him) this place is a richer destiny. 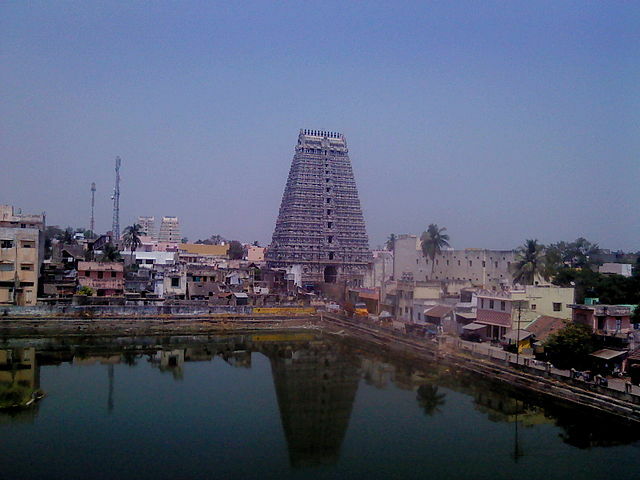 nammAzhvAr too said, ‘vAnavar vAnavar kOnodum Sindhu pU magizhum thiruvEnkatam [thiruvAimozhi – 3.3.7]’ (~nithyasUris along with their leader sEnai mudhaliyAr (vishwaksEna), have come to thiruvEnkatam); vAnavar vAnavar kOnodum – completely moved out (to this world). SrIvaikuNtanAthan is like the man of the house letting each and every one go, and then taking care of the house himself. thAn ugandha Ur – His liking this place is the reason for AzhvAr having affinity to it. Ur ellAm – (all the dhivya dhEsams) – before getting the true knowledge, like said in ‘avar avar paNai mulai thuNaiyA [periya thirumozhi – 2]’ (~seeking the company of many women), without having any restriction of any type (varNam/jAthi) of women, that is, everyone of them was interesting, but after getting the true knowledge, AzhvAr is having interest in all the dhivya dhESams. When AzhvAr is going to thirukkOvalUr for enjoyment, why say ‘Ur ellAm’? Like how when going (by walk) to a place one would break near the places where water is available, and shadow is available, AzhvAr is going through the dhivya dhESams that are on the way. When going for enjoying the big tree that is vAsudhEvan, it is in the shadows of that tree that one would rest before carrying on. As said in ‘sarvam vasatheethi vAsudhEva: ’ (He is one present everywhere (all dhivya dhESams), for AzhvAr it is those places liked by emperumAn that are to be reached; AzhvAr thinks of other places as desert. than thAL pAdi (singing about His divine feet) – one would need food during the journey; it is as said in ‘pAdhEyam puNdareekAkSha nAma sankeerthana amrutham [gAruda purANam]’ (for those taking the long journey, it is singing the names of the lotus eyed One that is the nectar, that is the appropriate food to carry. The divine feet that are the means and destiny for AzhvAr. Not saying as ‘thannaip pAdi’ (singing about Him), but as ‘than thAL pAdi’, it is the divine feet which he sang about earlier as ‘oru kAl niRpa oru kAlum [thirunedunthANdakam – 5]’ (One divine foot on the earth..), it is the divine feet that is the journey food for AzhvAr. pAdi – singing, which is induced by love. nilam … – It is before seeing peNNai (river) that AzhvAr would sing about the divine feet; after seeing peNNai, he forgot about the divine feet and started making poetry on this. What is the reason for this? Since he is having affinity towards that place, those who are interested in that place are his companions. nilam parandhu varum – Since a woman (river) is going for enjoying purushOththaman, she is going with utmost interest. Due to the extreme love in going to thirukkOvalUr, she is overflowing into the shores, destroying the houses there, and piercing, removing, and pulling away the small bamboo spurts out with the roots, and coming, jumping with great noise. kaluzhi – being muddled and being like forest river. Induced by love, she is feeling agitated. Is it appropriate for her to destroy His place when enjoying the matter of emperumAn? He won’t see the destruction of His place, it is her love that He sees. ghaNtAkarNan too said (to krishNan) ‘it is a rishi’s dead body; killed just now; please have the divine consumption of this now’ (as he was told by Sivan that he should request krishNan for getting mOksham; krishNan was not angry at him for killing a brahmaNa (or for tying bell in his ears (hence his name), so as to not hear the name of nArAyaNan), but saw his eagerness to be liberated). Due to happiness of seeing pirAtti (seethA), the monkeys had destroyed the garden that was dear to their king sugreevan, but when this news was told to sugreevan, he and the princes were happy, saying ‘our effort has been fulfilled’ – given this, it was not required (for hanuman) to say ‘dhrustA seethA’ (saw seethA). At this, embAr would divine – ‘if that garden was not there in between, it would have been the princes’ back that would have got damaged, as they would have shown their full happiness in there’. (It is good that the bamboos were there in-between for peNNai river – otherwise she would have shown that happiness on thrivikraman there). peNNaiyeerththa nedu vEygaL padu muththam – Just delivery would occur quickly if the hair is pulled on pregnant women who are about deliver – as the river pulls the bamboos from the root and attempts to wash them away, those bamboos deliver the pearls. nedu vEygaL – the tall growth of these bamboos is remembrance of His divine spanning of the world. undha undhi – induced by love, pENNai would push the pearls in to the paddy fields, and farmers would push them away as weeds, and the river would push back the pearls throughout into the fields which the farmers cannot match with their efforts. The richness of the dhivya dhESam is such that what grows is gold, and where pearls are weeds. Water bodies that grow gold (richness of grains). The Entity that is said as ‘pon AnAy [thirunedunthANdakam – 10]’ (you are being as gold), is what is grown by this place, you see! poygai vEli – place having such fields and water bodies around it (as fence). (Unlike) as said in ‘nadhees thatAkAni cha pUrayithvA [SrI rAmAyaNam – kishkindhA kANdam – 30-58]’, ((after) making the whole world happy by good rains, filling the rivers and tanks, and making paddies be full of grains, the clouds vanished from the sky), water bodies that are filled not by rain, but by the river. pUnkOvalUr – the enjoyment of the place is such that one does not have to go near Him there. as the divine mind heard the AzhvAr saying about the love of the river, enjoyability of the fields, and enjoyability of the town, it went flat like on a sick bed (could not get up from the experience), and had to be lifted up, thus shows AzhvAr. Or, since singing about the divine feet as in ‘than thAL pAdi’, the enjoyability of the divine feet and the singing in high note by the mouth had exhausted the divine mind, and so it was feeling weak. AzhvAr is saying go, and giving it his hand to lift it up. thozhudhum – He said earlier ‘nama ithyEva vAdhina: [mahAbhAratham – SAnthi parvam – 344-45]’ (mukthas would always be saying ‘nama:’ by their mouth) (as he said ‘malar puraiyum thiruvadiyE vaNanginEnE, where he talked about saluting by his mouth). In this, he is saying ‘badhdhAnjaliputA [mahAbhAratham – SAnthi parvam – 344-45]’ (mukthas would always be doing anjali by their hands) (since he is saying thozhudhum by his hands). Both are the experiences of the liberated (mukhthas), you see. This entry was posted in iraNdAm Ayiram, thirunedunthANdakam on October 13, 2017 by raghuram.